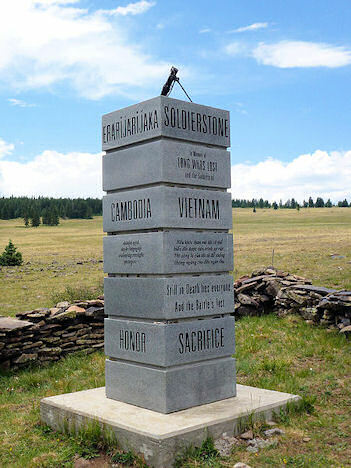 SOLDIERSTONE - stands in the Rio Grande National Forest with the Continental Divide as it's neighbor. 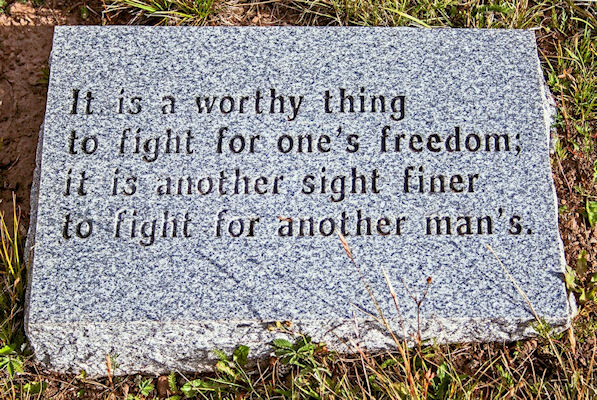 The granite pillar is about twelve feet high with text carved on it's sides. Arranged randomly outside of the low rock parapet that surrounds the pillar are granite stones inscribed with quotations in a variety of languages. SOLDIERSTONE was conceived, planned and financed by Retired U.S. Army Lieutenant Colonel Stuart Allen Beckley. He wanted to erect "a small memorial" to offer tribute from American soldiers to forgotten soldiers from "Vietnam, Laos, Cambodia, the Hmong, the Montagnard Tribes of Central Vietnam, the Koreans, Thais, French, Germans, Slavs, North Africans, Black Africans and others of all religions and persuasions who were willingly or unwillingly expended during the long wars lost in hopes, proud and vain, for the people of Indochina, 1945 through 1975." Lt. Col. Beckley (Ret.) conceived and paid for the monument, got it located and built on public land, wanted it kept low-key and unadvertised. So it was built without government fuss so that the nameless, unthanked soldiers would receive the unique recognition they deserved. According to his family, Stuart Beckley, made a career in the U.S. Army during the Vietnam War era, mostly doing Special Forces work training Thai armed forces in counterinsurgency methods, and spent time in Laos, eventually retiring in 1972. He retired as a Lieutenant Colonel and although he lived in Texas, he owned property near Westcliffe, Colorado. The SOLDIERSTONE project started in 1990 when Beckley met Mike Donelson, owner of Ark Valley Memorial, in Rocky Ford, Colorado. Beckley had Donelson purchase fifteen 300-pound gray stones the size of large tombstones. 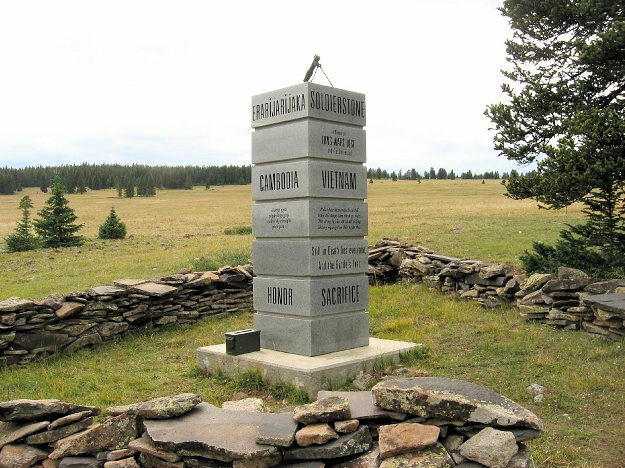 While Donelson and his assistant began sandblasting by hand the translated quotes Beckley had selected, Beckley began searching along the Colorado Trail along the Continental Divide to find a National Forest site ideal for the location of SOLDIERSTONE. Beckley was a prolific letter writer and planner who had a clear sense of what he wanted. Beckley soon launched a lengthy correspondence campaign; "I will begin the battle for sanction to place the memorial there. My Colorado land is held in reserve should I not gain permission to place it in the high Rockies, or should I die before we get installation approval." By 1995 Beckley discovered he had cancer and began undergoing chemotherapy treatments. In a letter to U.S. Forest Service, he wrote that he wanted "no publicity, no open congressional hearings and no media involvement. It is to be American soldiers' anonymous tribute to forgotten soldiers." That same year, the Forest Service aggreed to the plan and okayed Beckley's intentions to keep a low profile for the memorial. The one element Beckley and the Forest Service didn't factor into the planning was something that seems obvious now: the information-sharing hub provided by the Internet. After Beckley secured the location for SOLDIERSTONE, he began coordinating the efforts of volunteer groups and stonecutter Donelson before he died of cancer. He sent out copious notes and letters while he was still strong enough to type them. When he was too ill, he sent out voice memos. When asked what fueled Beckley's drive to build SOLDIERSTONE, Mike Donelson offered his opinion, "Always in the back of my mind, this project was something he needed to finish to kind of release, calm himself, maybe forgive himself," said Donelson. "That's the idea [I came to] over many years of conversation, and we became good friends." In one of his last letters thanking Donelson for completing SOLDIERSTONE, Beckley addresses the topic in his own way, writing: "Many of them died because of my 'push' and drive. Yes, I believed in what we were trying to do; and fought as much for them as for us, carrying a false hope that they would ultimately benefit. But they paid the ultimate price. But I think they knew that I cared; and now, very largely because of your help, my promise to them has been kept and I can go to a 'Soldier's Peace.'" With that letter, Beckley closed the chapter on his final mission. 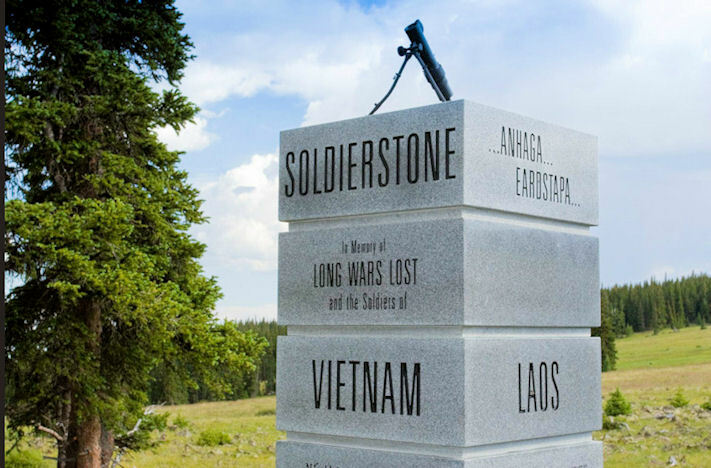 SOLDIERSTONE was completed in July 1995, but he was too ill to travel to southern Colorado to visit it. Lieutenant Colonel Stuart Beckley died November 5, 1995. In an unpublished book meant to accompany SOLDIERSTONE called Leaves of Stone, Beckley wrote that one purpose is to "serve as a poignant reminder of our battlefield allies. It also asks of America the maturity to honor the defiant stands of soldiers in their seasons of death." Monuments rarely change, but the people and circumstances surrounding them do. Rio Grande Ranger District spokesman Mike Blakeman said that recently there has been a significant uptick in traffic. "It appears that social media has caught up with SOLDIERSTONE," he said. The U.S. Forest Service is weighing the trade-offs as more people visit. To prevent dirt bikes and ATVs from riding right up to SOLDIERSTONE and destroying the surrounding fragile mesa, they constructed a fence. But "that has also had the unintended consequences of restricting access for individuals with disabilities," Blakeman said. "And so that's a concern of ours because there's a fair number of veterans with disabilities." "It's a place for solace, it's a place for people to be able to spend some time at the memorial thinking about some of the lost loved ones - people they were maybe at Vietnam with, or any of the other wars we've been in," said Blakeman. But along with more traffic comes a question about whether the traffic changes the central meaning of a memorial meant to be infrequently visited. "There's nothing that we can do or should do for that matter as far as slowing that traffic down," Blakeman said. "It's the nature of the times right now. Information flows a lot more easily out there and people have access to it." SOLDIERSTONE had been discovered - With no interpretive signs around SOLDIERSTONE, and no story on the Internet, the memorial has also taken on a broader meaning for visitors compared to Beckley's original intention. Thank You Colonel Stuart For Building Your Dream. Thanks to Templated dot co for providing this free webpage template.